Easy Time Tracking PRO is an ideal off- and online time tracking and billing solution for individual contractors to automatically track time spent on tasks, as well as expenses, e.g. mileage. It has a timer, and a web-based add-on, ETT Web, to log time through a web browser. Create professional looking invoices, including in your own language. Invoices can be saved as PDF or emailed directly to your customer. Create professional looking invoices automatically or line by line from scratch. Full and limited access user support, track and manage your entire team's time. Your web-based ETT Web account allows you to log time through any internet browser. Once approved by the adiministrator, entries can not be deleted or modified. Record and keep track of all payments, expenses and transactions. 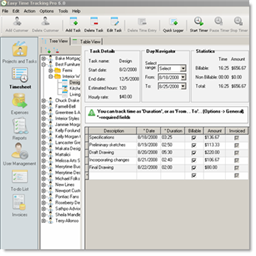 Customize, sort, group, filter, save and print your expense and timesheet data. Use diary, set events/reminders and synchronize time in intuitive manner. Easily track time for multiple staff, generate summary and detail reports. EasyHues Pro, a program that lets you explore the world of colors. tracks and analyzes PC activities, projects, software and Internet use. Qweas is providing links to Easy Time Tracking PRO 6.0 as a courtesy, and makes no representations regarding Easy Time Tracking PRO or any other applications or any information related thereto. Any questions, complaints or claims regarding this application Easy Time Tracking PRO 6.0 must be directed to the appropriate software vendor. You may click the publisher link of Easy Time Tracking PRO on the top of this page to get more details about the vendor.